Biography of Northern Renaissance Flemish Oil Painter. A Flemish painter and one of the leading Flemish painters of the Netherlandish Renaissance, Van Eyck mastered the art of oil painting, which was a new invention. He is considered one of the most talented painters of 15th century Europe and is best known for his highly realistic figure painting, usually on religious subjects, and portrait art. His hallmark three-quarter pose of face together with his mastery of oils brought a startling new realism to portraiture, and made him one of the foremost painters of the Northern Renaissance, much in demand by the newly emerging bourgeoisie and merchant class. His most notable works include the Ghent Altarpiece, (1425-32, Saint Bavo Cathedral, Ghent), the Arnolfini Portrait (1434, National Gallery, London) and the Annunciation, 1434 (National Gallery of Art, Washington). showing the illusionistic convex mirror. See also Male Nudes in Art History. Born in Maaseik, Belgium around 1395, little is known of his early life. It is thought that the painter Hubert van Eyck was his brother. Another younger brother, Lambert van Eyck is mentioned in court documents and it is thought he may have been a painter too. 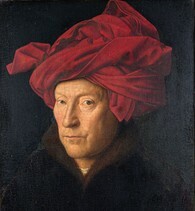 Van Eyck secured a career working at court, first for John of Bavaria between 1422 and 1424 and then with Philip The Good, Duke of Burgundy between 1425 and 1441. These positions were highly prestigious, and the regular salary allowed him to pursue a certain artistic independence. In fact Eyck developed a very close relationship with the Duke who served as godfather to one of his children, supported his widow on his death and later helped one of his daughters with funds to enter a convent. Van Eyck's family bore a coat-of-arms, which demonstrated that they belonged to gentry. And it is clear that he was literate because he signed his paintings, an unusual practice at the time. 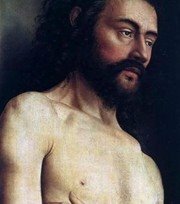 The Ghent Altarpiece is considered his first masterpiece (and one of the finest examples of Northern religious art), followed closely by the Arnolfini Portrait. Van Eyck's ability to manipulate oil paints to produce realistic representations of the natural world is why he became so popular, and remains so to this day. He frequently aimed to deceive the eye by using mirrors to reflect actions taking place off canvas. This can be seen in the Arnolfini Portrait, where the mirror on the rear wall reflects 2 figures entering the room, one is probably Van Eyck himself. The signature above reads 'Jan van Eyck has been here. 1434'. It was almost a version of early graffiti art. This work is a portrait of Giovanni di Nicolao Arnolfini and his wife, but is not meant as a record of their wedding. Mrs Arnolfini is not pregnant, as is so often thought, but holding up her full-skirted dress, as was the fashion at the time. Another reflected self-portrait, can be seen in the shield of Saint George in the Virgin of Canon van der Paele, 1434-36. Eyck was able to manipulate paint to create fleeting clouds and light reflections on different surfaces from metal to glass, dull to luminous. These effects can also be seen in his work Virgin of Canon van der Paele, in the glinting gold thread of Saint Donatian's cape, and the glow of pearls and dazzling jewellery of the holy figures. Other important works include the The Stygmata of St. Francis, c.1428-30 (Galleria Sabauda, Turin); Crucifixion and Last Judgement diptych, 1420-25 (Metropolitan Museum of Art, New York); Madonna in the Church, c.1425 (Staatliche Museen, Berlin); Portrait of a Man in a Turban, 1433 (believed to be a self-portrait) (National Gallery, London); St. Barbara, 1437 (Royal Museum of Fine Arts, Antwerp); Madonna and Child at the Fountain, 1439 (Royal Museum of Fine Arts, Antwerp); Portrait of Christ, 1440 (Groeningemuseum, Bruge) and St. Jerome, 1440 (Detroit Institute of Art, Detroit). As was common practice at the time, Van Eyck had a workshop in Bruges with assistants who made exact copies, pastiches and variations of his completed panel paintings for the market. He died in June 1441 and was buried at the Church of St Donatian (which was later destroyed in the French Revolution). In a 1454 biography, Jan Van Eyck was named the 'leading painter' of his day, alongside Antonio di Puccio Pisano (Pisanello) and Rogier van der Weyden. He influenced a generation of Flemish artists and after his death, his large volume of works went on to influence artists all over Europe. One of the greatest Old Masters of early Flemish painting, Jan van Eyck's artistic interests and activities, when compared with those of his brother Hubert, seem singularly narrow. He was chiefly a portraitist. Much of the last sixteen years of his life was spent in travel as a confidential agent for the Duke of Burgundy. For these years we have twelve pictures, mostly tiny portraits and small altarpieces, with whatever he may have painted on the Ghent Altarpiece. It is a very scanty production, even allowing for pictures now lost, and it suggests that Jan had little creative urge, but depended on occasion. We start with four miniature religious paintings which are often ascribed to Jan - God the Father Enthroned, the Lamentation, the Agony in the Garden and the Crucifixion. The reason for the attribution is a drastic and even vulgar realism, and a handling of drapery in angular folds based on wood sculpture. Such characteristics set these miniatures apart from the nine ascribed to Hubert. It is of course possible that he may have had an assistant, other than Jan, who did this work, but since the miniatures are of a technical excellence entirely worthy of Jan, to ascribe them to him seems the reasonable course. He was probably about twenty-five years old when they were painted. In 1422 we find Jan working in the Castle of the Hague for John of Bavaria, Count of Holland. Since this mural decoration mav have been on secular themes, its destruction is much to be regretted. We may only guess that Gothic tapestries of the moment give the general look of such work. Count John died early in 1425, and the decoration of the castle was already completed, for when in May of the same year Jan thriftily accepted a position as "varlet de chambre" to Philip the Good of Burgundy, the bargain included an allowance or moving Jan's effects from Lille to Bruges. From now on Jan was frequently employed on secret missions for the Duke, often to distant parts. He seems to have become a confidential agent, who (in Whistler's words) "also painted." It seems likely that the very elaborate Annunciation, in the National Gallery of Art, Washington, may have been painted at Lille before 1425. The event takes place in a Gothic church which, while fantastic in design, recalls the high naves of French churches of about 1300. Upon this interior Jan lavished work and attention. Everything is accounted for - stained glass, mural painting, pictured tiles, complicated stone carving. The details are marvellous, but the feeling of interior light is only feebly conveyed, the figures are badly out of scale with the architecture and in perfunctory relations to each other. The faint smirk on the archangel Gabriel's face forecasts the nervous grin of St. George in the Van der Paele Madonna. It is a trait which suggests an artist trying to express a feeling which he does not really experience. During the nearly six years between Hubert van Eyck's death and the finishing of the Ghent altarpiece by Jan, the latter made three long trips for the Duke, including a sojourn of over a year in Spain and Portugal, where the Duke was seeking a bride. Except for the Portrait of Cardinal Albergati, early in 1432, there are no signed pictures of Jan for these years, and it looks as if he were too busy to make them. During these years he was also far too deep in other matters to have painted or even finished any considerable portion of the Adoration of the Lamb, and whatever he did to it was probably done in the year or so preceding the unveiling on May 6, 1432. He painted the whole of the backs of the shutters, excepting perhaps the portrait of Jodoc Vyd, which was probably done by Hubert, and of the open altarpiece surely carried to completion the Adam and the Singing Angels, and probably most of the figures on the left-hand panels. This amount of work could hardly have been finished within a year, and we may reasonably imagine that Jan devoted much of the two years after his return from Spain at the end of 1429 to the pious task of completing his elder brother's masterpiece. The Portrait of Elizabeth Vyd in prayer is one of Jan's finer portraits, notable, as we have already remarked, for its large scale. It gives a formidable sense of presence, and is unforgettable in its stark energy of character; for the rest, like most of Jan's portraits, it is seen like so much still life with no expenditure of sympathy on Jan's part. Now great portraiture sets one to wondering what the sitter thinks and does when not a sitter. In Jan's portraiture there is little enough of this overflow beyond and behind the frame. His men and women are eternally frozen in the aspect he caught in his studio. It is precisely because the companion Portrait of Jodoc Vyd subtly and almost humorously blends the episodical humility of a devotee with the habitual cunning of a man of great affairs, that one imagines it was created it was created not by Jan but by Hubert - a psychological difference which is confirmed by differences of physical construction. One feels that the attitude of Jodoc is prayerful, while Elizabeth is merely in an attitude of prayer. Most, not all, of Jan's portraits have this detached, still-life character. Before considering them it may be well to survey his few religious pictures (other than his early Annunciation, 1425-30). The charming little Madonna (1433), is entirely disarming in a richness which paradoxically expresses a homely domesticity. To make the Divine Mother simply a rich and youthful Flemish matron, to enthrone her richly and conventionally under a brocade canopy in her own home, while leaving her equally indifferent to its well-furnished cleanliness and to the infant playing with her prayer book on her knee - this was surely a very novel and picturesque invention. 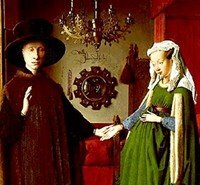 There is something comfortable and even delightful about the assurance with which Jan insists that no better symbol of the Blessed Virgin can be found than a prosperous Flemish housewife who, without fuss or undue concern, keeps both her home and her babe in order. Incidentally, it is a bachelor's vision. While it is probable that Robert Campin may earlier have made Madonnas of this bourgeois type, none is finer than this little picture of Jan's. It is really a miniature, about nine by six inches, and the fastidiously elaborate rendering of the accessories is entirely proper to the scale. A little later Jan enlarged and changed the composition in the Madonna at Frankfurt-am-Main, and though a sumptuous picture, it is also a rather stiff and empty one. The altarpiece of Our Lady and Child with St. Donatian, St. George and Canon van der Paele, at Bruges, is generally regarded as Jan's masterpiece, and perhaps justly so. Of the larger panels of the moment no other is so profusely enriched. Stuffs, embroidered and jewelled borders, polished and curiously carved stone-work, elaborately fashioned metal, translucent glass, are juxtaposed, with hardly a gap to rest the eye or release the imagination. As painting, in a harsh and metallic way, it is magnificent. The Van der Paele Madonna was signed in 1436, shortly after Jan's marriage. He was in his mid-40s and at the height of his powers. The little unfinished St. Barbara (1437), is the only creation of Jan's that is gracious and charming. Had he finished it, doubtless he would have painted out much of the charm. The exceptional attractiveness of this little picture depended on a very simple decision - to give St. Barbara an actual tower in process of building instead of the usual tiny emblematic tower. She sits meditatively over her book of hours, oblivious of the work going on in her honour behind her. The elaborately lovely Gothic structure rises lightly. Workmen are busy on ledges, on scaffolds and about the base. Jan either had great talent for architectural design, or, as is more likely, thriftily and tastefully used the sketch of an architect friend. Beyond the tower there are receding, gently drooping and rising lines of hills, punctuated by single trees and coppices. There is much about this picture that makes one wish Jan had been an engraver; the point rather than the brush seems the tool really congenial to him. As showing the way in which an early Flemish picture was prepared, this little panel is indeed precious. When we think of parts of the Adoration of the Lamb left unfinished by Hubert, we must imagine them like the St. Barbara, elaborately drawn out on the panels and needing only to be coloured. The tiny panel of Our Lady and Child by a Fountain, dated 1439 and at Antwerp, has evident relation to the garden pictures of the Rhenish school. The closed garden, hortus conclusus, and sealed fountain, fons sigillata, are established symbols of Mary's virginity. Jan has worked out the details of vines, flowers and the fountain with the most loving care, and the very small scale of the picture, as always, has been favourable to him. For the Madonna he has chosen a type which is at once exceptional and wholly his own, in a Mary who is humble and tender without aristocratic pretensions, while he shows an unusual vivacity of observation in the naturally flung attitude of the active Christchild. Of course Jan van Eyck must have painted portraits before he entered the service of the Duke of Burgundy, but those that have come down to us fall within the last ten years of the painter's life. In the Burgundian court he found magnificent sitters with faces shaped by character, often grotesquely. Merely to treat such masks as still life was to make very interesting pictures, and this in the main is what Jan did, simply animating the face by some trick of suggesting aggressive intentness in the eyes. Generally the faces he painted cannot be conceived as moving, as being other than they are. They hold the eye, but they do not enlist the imagination. The earliest is that of Nicholas Albergati, saintly Cardinal of St. Cross, who was in Bruges (December 8-11, 1431) on a peace mission. This learned and devout Carthusian would have preferred the quiet of his Roman cell, but his friendly tact and diplomatic ability made him a wanderer about Europe. At Bruges he stayed with his fellow Carthusians, and at the charterhouse Jan van Eyck must have persuaded him to sit for a couple of hours. The result was one of the most precious relics of early Flemish art, the silverpoint drawing of the Cardinal with annotations of the colours, in the print room at Dresden. It is of small scale, very sensitively caressed by the silver stylus, and it suggests much of the humility, benignity and shrewdness of the prelate whom the Pope described to Charles VII as "free from all passion." In the oil painting at Vienna, which a little later was made from this drawing, there is considerable loss of expression. The forms have hardened and frozen. One senses a man of moral dignity and force, but not the various gifts of the diplomat Cardinal. And this raises the issue already posed by the unfinished St. Barbara, whether all the portraits of Jan do not represent the loss of some drawing much finer than the painting we now see - whether, in short, his gift as a draughtsman was not superior to his gift as a painter. However that be, the procedure of painting a portrait not from the sitter but from a carefully prepared drawing remained standard for Western Europe for over two centuries. It was the method of Hans Holbein, of the Clouets and their successors. It had many advantages over the practice of painting from the sitter, which grew up during the era of Renaissance art (1400-1530). The final character of the portrait was established in a single intent act of observation. To attain this character, the significant forms had to be sought strenuously, and eliminations and syncopations made unsparingly. On such intense initial observation the artist stood firmly. The painting was guided as to colour by notes on the drawing and by memory. Consequently colour and lighting were somewhat generalized. The painting went on confidently and one may imagine almost mechanically. There was no concern with small particularities of colouration, no confusion from change of mood or shifting of light. Such portraiture was not precisely true to any momentary appearance, but it had a timeless sort of truth of its own, taking the sitter out of a changing world into a realm that is changeless. Simply as records, the portraits painted in this way seem to me the best and truest we have, if only because there is no division of interest in making them. The great portraiture of the later Renaissance - by the Venetian Titian, the Dutchman Rembrandt and the Spaniard Velasquez - had to cope with the appearance, with actual illumination, with decorative fitness, with intimate interpretations, and while the harmonizing of these many endeavors produced much greater works of art than the late Gothic portraits, I doubt if it really produced, in the narrower sense, better portraits. The portrait of a scholar labeled in Greek letters Tymotheos, at London, is dated October 10, 1432. Its general stiffness is at once enhanced and relieved by the awkward but natural action of the hand holding a scroll. The expression is searching, if a little worried and pathetic. There is an effort for intimate interpretation rare in Jan's portraits, which suggests that we have to do with someone dear to him. As an apparition it is astonishingly real, and the workmanship is of the finest. The tension of the modeling and the unpleasant bricky ruddiness of the hue are, for me, sufficient evidence that within a year of this work Jan could not have painted much on the Ghent altarpiece. Its easy modelling and the lightness of its carnations are of quite a different sort. Dated about a year later, the portrait of a Man in a Red Turban, in the National Gallery, London, differs only in being more linear and in the transparency of the shadows. It expresses an old age at once shrewd, wistful and defiant. Without good reason many critics regard this as a self-portrait. Despite, or perhaps because of a somewhat provincial and homemade look, it is one of the more pleasing of Jan's male portraits. Sir Baldwin de Lannoy was one of Jan's companions on the Portuguese mission of 1428. Jan has searched all the concavities and convexities of the wasted face, omitting no wrinkle, with the result that the portrait is completely wooden and expressionless. It is a hard mask behind which there seems to be nothing. The collar of Lannoy's Golden Fleece sits rather badly, which may suggest that the portrait was painted early before the award of the order, and that the insignia were added later. In that case it may be the earliest portrait by Jan that has come down to us. In any case it is one of the more aesthetically negligible. The portrait of the goldsmith, Jan de Leeuw, at Vienna, has more style than most of Jan's portraits. It is handsomely set in the frame, even if the hand holding a ring is awkwardly placed. The plastic effect is secured without over-emphasizing the modelling. It is an attractive presentation of a capable and robust personality. It has nothing of the strenuously homemade look of many of Jan's portraits, rather an Italian simplicity, concentration and elegance. All this may suggest either that in painting a fellow craftsman Jan worked with exceptional sympathy, or, equally likely, that he had become conscious of his defects and was seeking a broader style. By this time he must have seen the admirable portraits of Rogier van der Weyden - sensitive, broadly conceived, distinguished for tactful elimination - as well as his wonderful masterpiece Descent From the Cross (1435). He could not imitate them, his nature forbade that, but he could move their way. This was in 1436. Perhaps the finest of Jan's portraits is that of his wife Margaret, at Bruges, painted June 17, 1439. Whether as sensitive characterization or simply as so much finely disposed material, Jan painted nothing more handsome. The pattern and the tinted whites of the headdress are perfect; the roseate carnations of the flesh have nothing of Jan's earlier unpleasant brickiness; the solid modelling is effected by infinitesimals of luminous shadow; the expression is of a patient and rather sad benignity and wisdom. Nothing is amiss save the ill-placed hand, which is a restorer's contribution. It is hard to realize that this is a woman in the early thirties. Seen by an eye respectful, one hopes loving, but also relentlessly observant, after five centuries she is tremendously alive in her fading comeliness. For a similar rightness and beauty of workmanship the undated portrait now in Berlin and generally called John Arnolfini must have been painted about the same time. It seems to me that it bears only a casual resemblance to the famous John Arnolfini and his Wife in the National Gallery, London, and that the identification lacks a sound base. Of all Jan's portraits it is one of the best composed. The long horselike mask has an odd deadness, a relaxation which is perhaps only a sign of self-control. The fleshless eye sockets and tired eyes seem to me that of an ailing person. Traditionally this is a self-portrait, and such may very well be the case. It suggests the hard-won imperturbability of a man who had to double the function of painter with that of secret agent and courtier. However that be, and despite its considerably damaged condition, this seems to me one of Jan's latest portraits and one of his best. It has the elegance which seems to be an attainment of his last years. If the celebrated portrait of John Arnolfini and his Wife, at London is being treated out of its chronological order, it is because it is exceptional in Jan's activity, and his masterpiece. Fundamentally it is a portrait of a richly appointed room. Everything is included and defined - windows with bull's-eyes transmitting cool light, a most elaborate chandelier of yellow metal, a diminishing mirror with the reflection of two figures entering the room from the front, its tiny medallions of glass or enamel with passion scenes in the mirror frame. But there is no confusion or over-emphasis, merely a harmony of great richness; everything keeps its place in a scene impregnated with an opulent restfulness. In many ways this picture anticipates later triumphs of portraiture of rooms by Jan Vermeer of Delft, but when we come to the figures the analogy fails. Vermeer's figures belong. One may regard them as a necessary emanation from the space, or the space as a sort of extension of the figures. Jan van Eyck's husband and wife have no air of being at home; they stand stiffly and awkwardly like visitors enduring the discomfort of being portrayed. The portraits are admirable. One fairly hates the sanctimoniousness of the money-grubbing Italian merchant Arnolfini; one likes the doll-like comeliness of his youthful bride, who seems to be masquerading not very successfully as one of the St. Catherines or St. Barbaras of Hubert van Eyck. Husband and wife are unrelated to each other and by no means agreeably related to the space they occupy, but they imperiously hold the eye. Everything except the shaggy white terrier is conceived as so much splendid still life. No other picture reveals so impressively Jan van Eyck's marvellous technical resourcefulness and his spiritual limitations. The panel bears the curious inscription "Jan van Eyck was here, 1434." Certain critics, ignoring the apparently sound identification of the figures as John Arnolfini and his wife, interpret the inscription to mean Jan van Eyck lived here, and hold that the persons are Jan and his wife Margaret. It is unnecessary to contradict a far-fetched theory justified neither by the form of the inscription - anyone mentioning his home would have used not the perfect but the imperfect tense - nor by the age of the sitters, nor by any resemblance of the very young woman to the portrait of Margaret van Eyck painted only five years later. As a mere suggestion, the inscription may mean that Jan painted the picture on the spot, as distinguished from his general habit of painting in the work shop from a drawing. Indeed, it is hard to see how the picture could have reached its material perfection unless it were painted before the objects themselves. As painting it is unquestionably Jan's greatest work, and from a technical viewpoint there is no finer late Gothic picture. On July 9, 1441, the Church of St. Donatian, at Bruges, received payment for burying Jan's body. About a month later the Duke made the substantial gratuity of 360 livres to the widow. Less than a year later Jan's brother, Lambert, arranged for moving the body from the churchyard to more honorable sepulture in the church itself, and the estate endowed an annual mass for the repose of his soul. They were taking notable pains after his death about a person who had been notable in life. Wherever we meet Jan in records it is as the employee of some potentate. He had met the great of the earth, had traveled widely. The Duke had stood godfather to his children, and had used him for difficult and delicate missions. To the courtly, official world in which he moved, Jan brought acceptance and a most accurate eye. Without criticism he gave the look of his world. The imagination goes forward two centuries to another painter and court chamberlain, Velasquez. With the difference imposed by the times, he was to do at Madrid what Jan had done at Bruges - give a dispassionate but amazingly truthful account of what he saw about him. From painters who are also chamberlains, official or unofficial, no poetry is to be expected. Enough if they give us the unvarnished truth. Jan's age at death we do not know, but it is unlikely that he had reached his sixties. Velasquez, too, barely reached that term. To be at once artist and courtier apparently does not make for longevity. 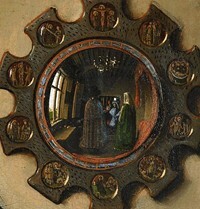 Suppose Hubert van Eyck had not been early forgotten and all his most gracious creations had not been attributed to Jan. Suppose we eliminate all contested attributions and make our estimate of Jan from the pictures which are surely his - would that estimate be very different from that which is being suggested? Suppose Jan had not enjoyed for four centuries a great and favorable publicity as the inventor of oil painting, suppose we had just his signed and reasonably attributed works - would any sensible critic think him a great artist in the sense that, say, Rogier van der Weyden and Hugo van der Goes were great artists? Probably not; one senses that the verdict would be that Jan's lack of range and of spiritual vision emphatically excluded him from the class of great artists, while as surely he was a very great painter. Though the brilliant innovations of the Van Eycks were widely imitated, they seem to have few direct pupils. Indeed Petrus Christus seems to be the only one whose discipleship is perfectly sure. He was born in eastern Holland, probably before 1420; we first meet him admitted as a master painter at Bruges in midsummer of 1444. It is reasonable to suppose that he had been an assistant of Jan van Eyck. But on the whole he seems rather influenced by the painting of Hubert, two of whose compositions he copied freely - the Last Judgment, and the Rothschild Madonna with a Canon. Both these pictures are at Berlin. Hubert's easier line and modeling reappear in Petrus Christus, as also his preoccupation with effects of light. In his various religious pictures, represented at Madrid, Berlin, Antwerp, Washington and New York, Petrus is a good rather than a striking artist. He shows some tendency to increase the relative scale of the figures, is always thoughtful; as a colourist, rather adequate than distinguished. One delightfully romantic painting, at New York, an Annunciation before an ivy-clad Gothic portal, is generally ascribed to him. If so, it must be regarded as a remarkable and probably quite early assimilation of the idealizing manner of Hubert. This entrancing little picture has been ascribed to Hubert van Eyck, although more likely it is a copy or version of a lost picture by Hubert. The slack quality of the figure painting hardly justifies an attribution to any great painter. Petrus Christus was an excellent portraitist. His portraits are related to the observer, have a certain vivacity rare at the time. None of them seem highly distinguished except the grim and amazingly vivid likeness of a Carthusian, in the collection of Mr. Jules Bache. In the facility of its execution and relatively large scale it marks a progress. Indeed at long range one might pardonably indulge the momentary error of seeing a very hard and early Rubens. It is dated 1466, and is far more modern in accent than the contemporary portraiture of Rogier van der Weyden and Dirck Bouts. Petrus Christus's most inventive picture is the St. Eligius with a Bridal Pair, (1449). It is conceived entirely as a genre painting, for St. Eligius is merely a goldsmith in his shop, shrewdly dealing with a cautious young husband and wife. The picture is quite beautifully painted and the lighting of a roofed but open space very carefully studied. It is perhaps the better that there is no emphasis of the shopping motive, the attraction resting on the assemblage and refined representation of materials. It stands at the head of a long line of genre subjects in half length, notably those of Quentin Massys and his imitators. Our last notice of Petrus Christus is in 1473 and we know that by 1477 he was dead. He had followed with humility and intelligence the best models, and had made his own modest contribution to the progress of his art. Of rather few minor painters can as much be said. The art of the Van Eycks is an episode and not in the direct line of Gothic realism. Just as the Burgundian dependencies in which they lived managed to keep out of the tragic events of the Hundred Years' War, so the art of Jan and Hubert van Eyck evaded the harsher religious emotions of the time. Their art has always a courtly and moderated character, and this they passed on to the later school of Bruges, and such masters as Hans Memling (c.1433-94). Works by Jan Van Eyck can be seen in the best art museums across the world.  For the evolution of fine art, see: History of Art Timeline.